For some time is available for download NOD32 Antivirus! ESET NOD32 Antivirus is a top antivirus, that rivals the world with famous antivirus programs produced by leading companies worldwide. What knows to do NOD32 Antivirus? 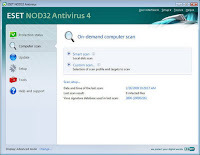 NOD32 Antivirus uses the ThreatSense engine, designed to offer protection against attacks, even "zero-day", even if not constantly updated database for NOD32 antivirus to recognize even the latest virus signatures. However, the main advantages of NOD32 Antivirus of protection is that it provides continuous real-time control of the media in terms of access, disinfection and secure e-mails and energy saving of portable devices (laptops). 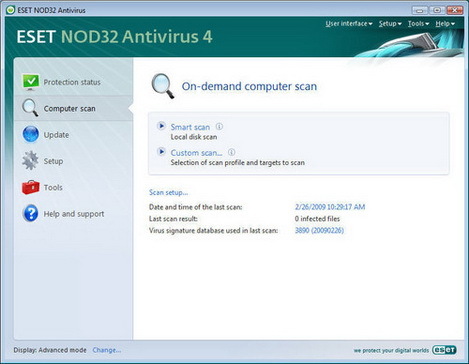 What's new in NOD32 Antivirus? - Automatic updates is running in the background and not burdensome the PC. - HDD space: 37 MB for download and 230 MB installation.